Dear reader we are now familiar with earthquake induced liquefaction. Liquefaction is studied carefully in geotechnical earthquake engineering as it is one of the most interesting, complex, controversial and important as well, topics in this filed. In 1964 two earthquake drew attention of engineers, experiencing devastating collapse of ground, structures etc. 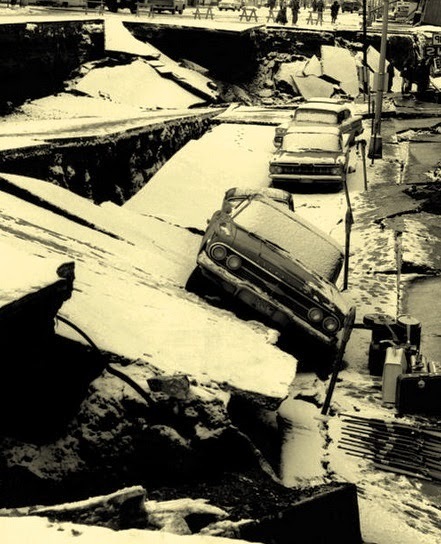 This is also known as 1964 Alaskan earthquake, Great Alaskan earthquake. This was a megathrust earthquake having magnitude of 9.2 (moment magnitude) which lasted for 4.38 mins. This earthquake is considered most powerful earthquake in United States, obviously recorded, and also of North America. This earthquake also struck in 1964 having magnitude of 7.5. Niigata city was built with sand from nearby rivers (Agano and Shinano rivers) which was in unconsolidated state. Earthquake shaking was resulted liquefaction followed by instant compaction and many sand volcanoes were observed there. Lateral spreading due to liquefaction resulted failure of Showa Bridge. In the50 years since such earthquake extensive studies were conducted on liquefaction by many researchers all over the world. Many realizations were found, we have gained important information but still there have many problems. Different procedures, analysis techniques are introduced and controversies were also arisen but road was not smooth. In our following posting we will learn extensive information about liquefaction and its effects.